I have a medical client who has been using their corona machine for several years without too many problems. However, on occasion, the machine might hiccup for a few seconds. The glitch lasted long enough to allow sections of the filter plastic sheets to pass through the system without being properly treated. They needed to have a logic signal that would swing low when no corona is detected. 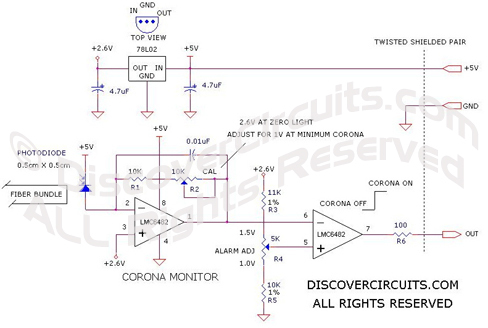 The light corona monitoring and alarm circuit I designed is pretty simple. The circuit is powered by +5v and has an on-board voltage regulator as a reference voltage. The current from a reversed biased photodiode is converted into a voltage using an op Amp circuit. That output voltage is fed to a voltage comparator circuit. I included an adjustment in the current to voltage converter. After setting the gain to produce a one volt output signal for a typical corona discharge, the comparator’s threshold voltage could also be adjusted. The device then changes states when the corona intensity dropped by about 20%. The alarm output of the monitoring circuit is connected to the company’s computer through a three pin connector. The alarm signal controlled the treatment process. When the computer sensed the corona alarm signal, it would shut down the system. A human operator would then back up the plastic film a few feet and rethread it into the take-up rollers. Finally, he would press the reset button, which told the computer to start up the film treating process again.